FDR found 3 flight seconds from last ATC position. That plane went straight down in VMC daylight conditions. The industry should be very interested in the accident investigation. I'm fluent in bahasa so I can understand what they're saying. 'Awas jatuh' is said repeatedly which means 'be careful, don't drop it'. 'Bantu bantu' means 'please help'. 'Di laporkan ajah' means 'report it' (report that they've found it). FCC controls both STS and AP stab trim and it gets CAS,AoA,IVSI from ADIRU as well as engine N1 from DEU and flap position from FSEU. In the NG the Elevator Feel System has its own pitots to determine airspeed and might be sensing very different data than the ADIRU. If the same is true on the MAX, could it be an additional source of confusion that the pilots might experience a combination of trim behaviour and yoke forces that they would not normally encounter? If the FDR and CVR recordings terminate at altitude, it could mean separation of the tail section. ...if the STS may be providing unwanted/surprising nose-down trim, is the AT also in the grips of unreliable (too slow) IAS, and thus push the throttles? So the crew is dealing w low level nose down plus increasing throttle/overspeed dangers? These days are not like the old days - FDR/CVR is written to solid state memory modules and doesn't necessarily need to be 'transitioned' from retrieval depth to surface depth. The reason for keeping recorders in clean fresh water when recovered from salt water, is that if the case or seals have been damaged and salt water reaches any of the electrical contacts, they will start to rapidly corrode once exposed to the oxygen in the air. Keeping the whole unit in fresh water delays that corrosion until it can be disassembled in a clean, controlled environment. Last edited by Speed of Sound; 2nd Nov 2018 at 16:10. I wonder, considering there are not that many contacts, why aren't they made of gold or something which does not corrode? Sure that can't be overly expensive? That's assuming the recorder is built around memory chips (not tape or wire). AFAIK you can't make a whole PCB (printed circuit board) out of gold only as for the conducting parts, including traces. Even if connectors wouldn't corrode, traces and chip legs would. Surface-mounted legless chips would be less vulnerable to corrosion but I don't know if FDRs/CVRs have that kind of technology. Aviation electronics tend to lag behind and stay on the less advanced / safer side of things. Anyway, they could always unsolder the non-volatile memory chips and put them on a dedicated reading equipment. To my knowledge, this has been needed several times in the past to read out data. It just takes more time. I'm fairly sure that advanced facilities have a way to even get to the dice inside chips and pull data from them. At the risk of stating the obvious, AF447's flight recorders were readable after nearly two years at the bottom of the South Atlantic. I believe the ADM (Air Data Module) will figure prominently in the report. Presumably because they were kept immersed in water until they were opened. As regards de soldering the memory chips or even breaking open the plastic case, introducing heat or static can risk damaging non volatile memory. Always better to read/download the data using the edge connectors provided where risk of damage is minimised. Disconnecting and disarming the autothrottles is something you do early in the unreliable airspeed checklist on the Airbuses and Boeings that I've flown. Is there some alpha floor or similar protection in the late model 737's that might still push the throttles up uncommanded? Stated in the report that the transcript was not verified. Some correlation to previous theories posted here. The pilot’s request to change altitude to 5,000 feet was approved by ATC and was requested to maintain altitude at 06:24.58. During this exchange, Bhavye asked the ATC to confirm the plane’s airspeed to which the ATC answered 332 knots. This ATC reported airspeed is about 40 knots higher than the ADS-B transmitted GPS groundspeed at 06:25 local time. The aircraft does indeed seem to try to maintain 5000 feet after that time. Take this news report with a grain of salt . . . which indicates Indonesia’s transport ministry found faults in two other Boeing 737-MAX 8 jets, including a cockpit indicator display problem . . .
if the instruments were displaying faulty data because of blocked pitot tubes/dodgy connections/et al, wouldn't it follow that the FDR data will also be suspect? But that finding in itself will be of value to the investigation. TEMPO.CO, Jakarta - The crash survivable memory unit (CSMU) or otherwise known as the ‘black box’ of the crashed Lion Air JT 610 has been delivered to the National Transportation Safety Commission (KNKT) after it was recovered by Basarnas divers yesterday. These are the three steps the KNKT will take to uncover the cause of the plane crash that happened on Monday, October 29. 1. Extracting the black box’s dataAccording to KNKT’s head of investigation, Ony Soerjo Wibowo, the team will immediately extract the raw data contained in the black box for further analysis. The KNKT will work in conjunction with teams from the United States’ National Transportation Safety Board (NTSB), Boeing, the Federal Aviation Administration (FAA), and General Electric (GE). Within a month after the investigation commences, the KNKT will issue a preliminary report on the elements that caused the Lion Air flight JT 610 to crash at Tanjung Karawang. This report will be available for the public by the end of November. The report will contain a number of records and facts compiled by the KNKT without an in-depth analysis. These elements will encompass factual information regarding the incident in chronological order, Lion Air’s organization, the data of the carrier’s experience and health, and the meteorology report during the time of the crash. The KNKT stated that the comprehensive final report will include every element in the preliminary report added with a thorough analysis, which will be completed in a year, adhering to the Ministry’s Decree. ...thanks for this Air Bubba. I do wonder about the struggle to gain altitude and the increasing speed, so thought about throttles together w the STS. I’d imagine a startle factor for sure when the nose pointed down. But given the issues w prior flight, would we assume a full brief pre-flight on Unrelaible Air Speed? It seems the crew should not have been taken by surprise? Assume CVR might show more. Anyway thanks again for such an enlightening forum. In some cases would the QAR (assuming it has one, think it is an option) yield useful information (assuming also intact) and if the FDR were damaged or as a supplementary sources? 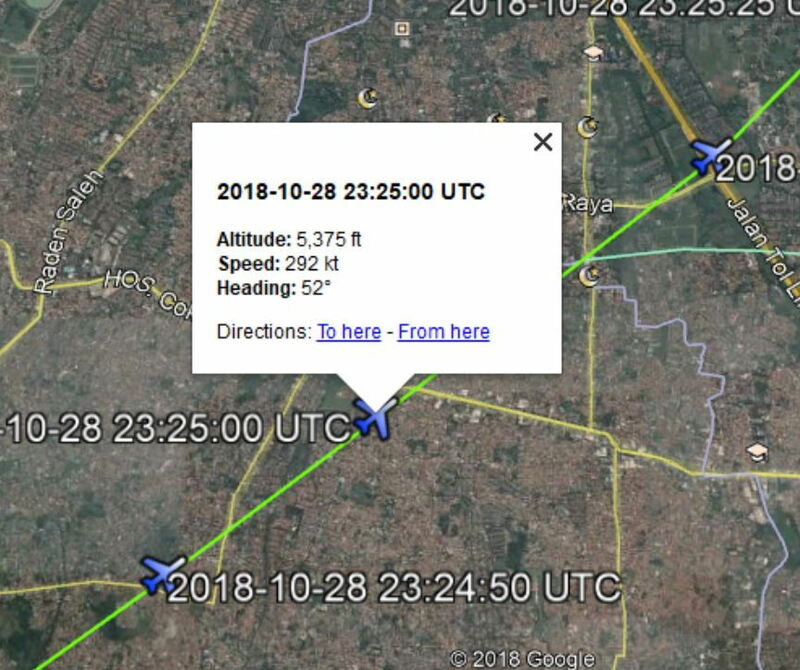 If the primary instruments were not correct could the pilot have referred to the GPS speed and altitude, they would not have been perfect but at least sensible enough to control the aircraft. Failure of pitot and / or static while not a regular issue are serious, is this a feature of simulator training?.